Beans! One of the main ingredients in a Mexican diet. We, Mexicans, have been eaten beans for centuries. Beans are as important as maize for us, we literally eat them almost every day in many different ways, from the pot, fried, in soups, as a cream, etc., but all beans always start this way, cook in a pot, well, traditionally in a clay pot, like the one you see on the picture, people say that beans that have been cook in a clay pot taste different and it is true, well at least that is what I discovered. You see, in my family, like any other family in Mexico, had a special pot to cook beans and a special frying pan to cook refried beans, my mum’s lasted more than 30 years, it was a aluminium pot, but I quite recently bought a clay pot and I started to cook my beans in it and I totally understand what people say, so if you have the opportunity to get a clay pot, do it! You will thank me for this advice, you’ll see! Ok, now talking about this recipe, yes! It is a very basic recipe, but there are some people that sometimes get it wrong and I include myself in that group, because it wasn’t until two years ago that I learned to cook beans properly, sometimes I used to put too much water or very little salt, so don’t feel bad if you are one of those persons as well. But let’s start with the recipe. Put the beans to boil at high heat in a large casserole dish with water, onion and garlic. At this stage don’t add the salt. When the water starts boiling, turn the heat down to low and cook for around 1 hour, check them from time to time and add more water if needed. After 1 hour try some, they will feel between firm and tender then add the salt, cook for 15 more min and check if they are completely tender, then turn the heating off and done. To have them as a soup, serve serve some in a bowl and garnish them with chopped onion, coriander, Serrano pepper and fresh or feta cheese. 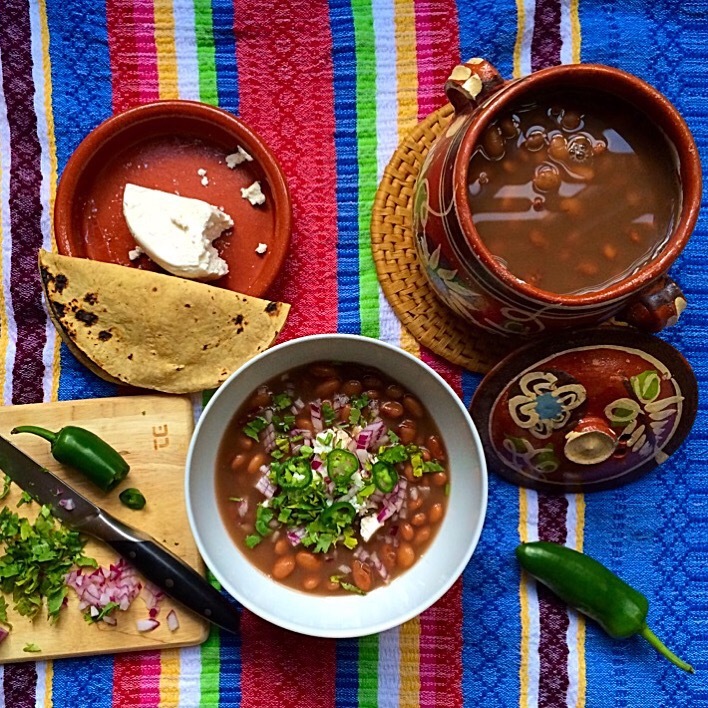 Karlita – do you soak the beans? Yes, just for two hours. Some people do it over night, but there is no need.